Going meat-free at Ahadu, an Ethiopian restaurant in Seattle’s Pinehurst neighborhood, isn’t a sacrifice. In fact, those in the know understand that the menu’s vegetable combination (from four to six plant-based dishes presented on a disk of spongy injera and big enough to share) is the best way to taste the range of the menu. But meat still plays a major role in Ahadu’s business. This fairly bare-bones, ordinary-looking spot, which operates as a restaurant all week, becomes the favored butcher shop for the Ethiopian community on Thursdays and Sundays, with an entire cow arriving at the strip-mall space. Diners can’t miss the line of customers that snakes out of the kitchen, each one leaving with a similar wrapped package. The animal comes from a farm in Centralia, says Menbere Medhane, who co-owns Ahadu with her husband. It is slaughtered by hand at a place in Moses Lake, then delivered the same day to the shop. When there’s meat left over from sales to the public and from what’s needed for the restaurant, Medhane makes it into beef jerky. There’s rarely meat left over. This is the third evolution of Medhane’s business, which began as a small market in 2005. After it morphed into a butcher shop in 2012, customers began to request that Medhane also cook the meat for them, then maybe some vegetables to go with it. She was game, but says it was essential that she start the restaurant with spices from her home country. Her late father worked in the spice business while she was growing up in Ethiopia. When famine and civil war ravaged the country, he sent her to live in Seattle. The teenager, who spoke little English when she arrived in 1986, lived with an older brother, attended Garfield High School and worked at McDonald’s to pay for her prom dress. In 2014, she returned to Ethiopia, where a few siblings and her mother still live, acquired the spices and returned to open her restaurant. Seattle has changed since Medhane first arrived. Finding the Ethiopian food she loves, that reminds her of her mother’s cooking, is easy now. But back then, important ingredients were hard to come by. She remembers fellow Ethiopians trying to make injera out of self-rising flour, even though the traditional spongy flatbread, which serves as plate, utensil and carb in Ethiopian meals, gets its signature texture and flavor from the grain teff. But no special ingredients are needed to make one of her favorite foods, fossolia, a dish that tastes mind-bendingly complex but is cooked with just a few ordinary ingredients. 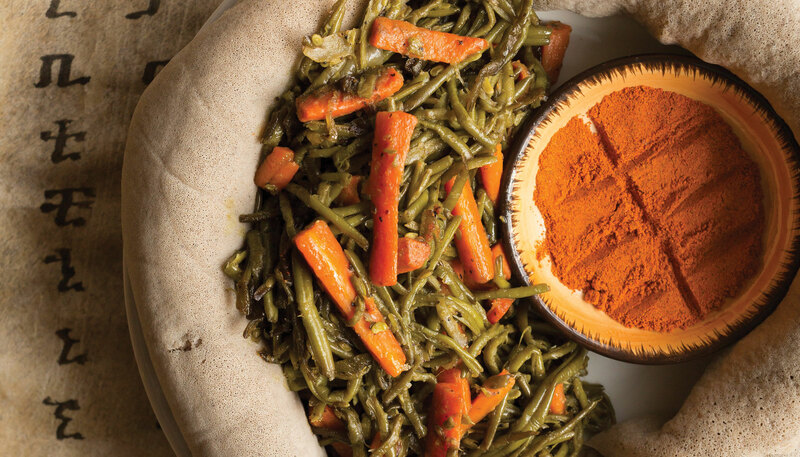 “It’s one of the most delicious but simple dishes to make from Ethiopia,” she explains of the string bean dish that is a staple in Ahadu’s popular vegetable combination. “There are nuances and variations to every version,” she says, but the keys are the garlicky base, the sweetness pulled from the carrots and red onions, and the finishing touch of the coriander. It’s one of the reasons that the vegetable combo is a favorite among customers—those new to Ethiopian food and those looking for a taste of home. Pinehurst, 1508 NE 117th St.; 206.440.3399. Trim green beans and cut longer beans in half for a uniform length. Rinse in cold water and pat dry. Cut carrots into thin batons of approximately the same length as beans. Heat 11/2 tablespoons of oil in a wok and sauté the green beans over medium-high heat until goldish green (8–10 minutes), then remove to a plate. Repeat with another 11/2 tablespoons of oil with the carrots, until goldish-orange (about 5–7 minutes), again removing to a plate. Heat the remaining tablespoons of oil. Sauté onions, adding in the salt and pepper. As the onions begin to color, add the garlic and stir continuously. When onions are brown, add the carrots and beans. Stir occasionally as they cook, for 15 minutes. Finish by stirring in coriander. “People always ask for a fork,” says Medhane of serving Ethiopian cuisine, but she encourages everyone to eat like Ethiopians, using their hands to scoop up bits of food with injera. For classic Ethiopian presentation, serve on injera, with a sprinkle of mitmita (Ethiopian powdered chile pepper), both available at Ethiopian markets around the city, such as the one next door to Ahadu, owned by neighboring restaurant Jebena Cafe.